Thanks to Review Raja, today I discovered a very interesting upcoming Tamil movie, Puli, which I somehow hadn’t heard about before. The main role is played by Vijay who I really don’t know as well as I should, but the supporting cast includes some very big names (at least big for me, if not officially big names), like Sridevi, Sudeep (! ), Prabhu, Shruti Haasan, and Hansika Motwani. The teaser trailer released just today. Ragada is a 2010 Telugu film directed by Veeru Potla. It stars “King” Nagarjuna in the hero role, and the movie indeed repeatedly reminds the audience about who the king is. I actually started to watch the movie a couple of years ago but had to pause after 30 minutes and never remembered to continue. The plot has so many twists and turns that it would be hopeless to explain it all here, but basically it’s about the hero who likes money and doesn’t like the rich bad mafia guys who are threatening his mother and sister. Previously I had seen two Veeru Potla’s films, Varsham (2004) and Nuvvostanante Nenoddantana (2005), which are both nice but in my opinion just around average level movies. Perhaps expectedly, so is Ragada. I haven’t seen too many of King Nagarjuna’s films but I’ve seen him quite a lot in Meelo Evaru Koteeswarudu, the Telugu version of Who Wants to Be a Millionaire? (Which is very helpful in learning Telugu as the questions are shown in both Telugu and English. Also, many questions and special guests are related to Telugu cinema.) Ragada isn’t as good as some other Nagarjuna’s films, like Manam. But Nagarjuna still manages to show that he’s the King, at least in Ragada’s universe. I don’t really think he’s doing anything that other Tollywood heroes wouldn’t be capable to do. The female lead roles are played by Anushka Shetty and Priyamani, “bullet” and “chocolate”. Both of them have important roles in the story but are unfortunately forgotten a little before the end of the film. Ragada also nicely counts towards my goal to watch all movies by Anushka. I see her as one of the strongest of the current Tollywood heroines as she somehow has managed to successfully act in main role multiple times without a male hero in such a male-centric film industry. I believe I’ve now seen 9 of 36, or 25%. Pradeep Rawat is the typical Tollywood villain. He shouts much and kicks furniture around. He does exactly what is expected and required from a Tollywood villain. One of the minor villains is played by Dev Gill and he’s of course good at it. He actually was my main reason to watch Ragada when I first tried to watch it some years ago, as I had seen him in Magadheera and he has acted in surprisingly small number of movies. There are present also some of the compulsory but entertaining Tollywood things, such as Naga Chaitanya’s (Nagarjuna’s son) Ye Maaya Chesave movie poster at the background and a street fight that gathers a huge audience and when the baddies eventually run away, the spectators just leave the scene silently precisely at the same time. Brahmanandam’s comedy is above his average, or at least easier to understand through subtitles than his usually dialogue-heavy jokes. His introduction scene is one of the funniest I’ve seen from him so far. I don’t think the character is too important for the storyline but he has a lot of screentime as his main purpose is flirting with Anushka. Mithran Jawahar’s Kutty (also spelled as Kutti) (2010) is the Tamil remake of Sukumar’s Arya (Telugu, 2004). It stars Dhanush, Shriya Saran, and Sameer Dattani in the main roles. Devi Sri Prasad, the music director of Arya, composed the music also for the remake. While some songs are familiar from the original Arya, some other great songs are replaced with new and not-so-great songs. “You Rock My World” has been entirely cut off. Overall, Kutty might be an OK movie but it’s not possible to not to compare it to the original Arya and it just doesn’t have anything new to offer. I would recommend this only if you like the actors or are a curious Arya fan. Otherwise it would probably be better to watch Arya instead. The teaser of the most ever awaited S. S. Rajamouli’s epic Baahubali: The Beginning has been released! Full trailer will release on June 1. Unfortunately the apparently spectacular 1-crore audio launch function was postponed but it too will most probably happen very soon. I hope there will be a YouTube live stream available as it has been quite common thing for the audio release events of big budget Telugu (but for some reason not Tamil) films. I think I saw some similarities to Rajamouli’s Magadheera. I wonder if Prabhas will defeat more than 100 men. With this post I’m starting yet another new experimental post series. This time it’s called Mega Power Quiz and it’s a quiz game for my (probably nonexistent?) readers. There might be no one who would be interested to take part in the game but that doesn’t stop me from creating questions! At least for now I don’t have any predefined schedule for new questions and I’ll just post one whenever I happen to come up with something that isn’t too easy to solve with Google. Unfortunately I cannot (at least not yet) offer any prizes for the winners but whoever is the first to post the correct answer in the comment section of this post will get 1 point and the leaders of the scoreboard can call themselves the Mega Power Sages of Indian cinema – how cool is that! What is the connection between these twelve movies? Hint #1 (added Nov 19, 2015): Thirteenth movie that would qualify to the above list would be the 2015 Tamil fantasy film Puli. I continued my Hindi adventures with a 7.5 hours long Dhoom marathon. I liked the third part the most. Abhishek looks just like young Amitabh! I also finally watched 7 Khoon Maaf and My Name Is Khan. All of these are very different than what I’ve used to by watching South Indian movies but still quite enjoyable. Businessman: This movie sadly had nothing special to offer. The hero doesn’t even have to face any major problems. Upendra: I rewatched this one as requested in the end of the film because “IT’S A 2D FILM” but I really didn’t learn anything that I hadn’t get at the first watch. If I’m going to rewatch it again some day, I’ll have to count how many different outfits Upendra has. It has to be somewhere near the world record. 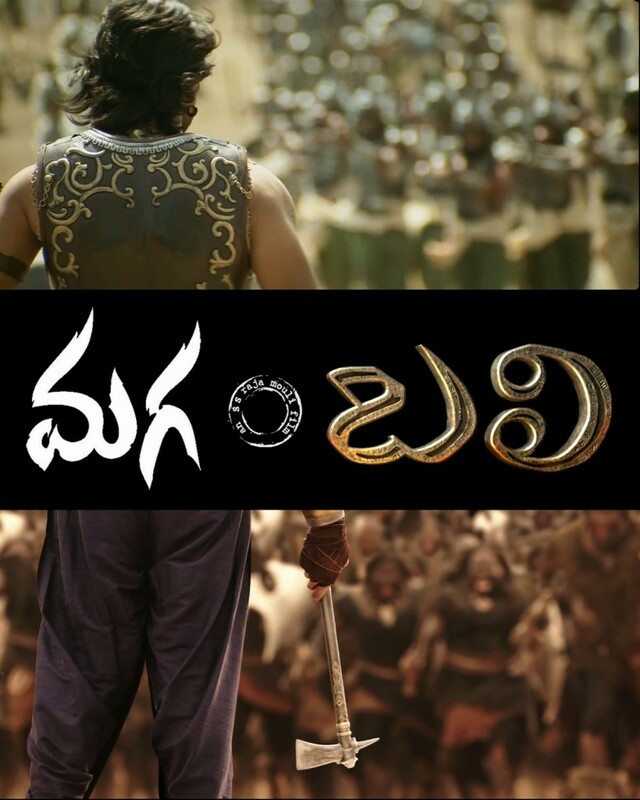 Vedam: I rewatched also this one and it’s still one of the best Telugu movies that I’ve seen! Crocodile Love Story: Two lovers are trapped in a tree guarded by a hungry crocodile! The movie has its moments but it isn’t as good as it could have been (which is sad because I like crocodiles). Shankar Dada M.B.B.S. : This was actually much better than I expected. I had to watch it because its sequel has Allu Arjun’s special appearance, but it was also nice to improve my knowledge of Chiranjeevi’s filmography as so far I’ve watched mostly the younger Telugu stars. Awesome usage of Nokia 2310 (a non-touchscreen model from 2006) in Vedam. So, after a short wait (just a couple of days earlier I had heard that there was going to be a screening) I was finally able to see Trivikram’s S/O Satyamurthy (which means “Son of Satyamurthy”) on last Saturday. Furthermore, the film had subtitles and it played in a new movie theater less than a kilometer away from where I live! 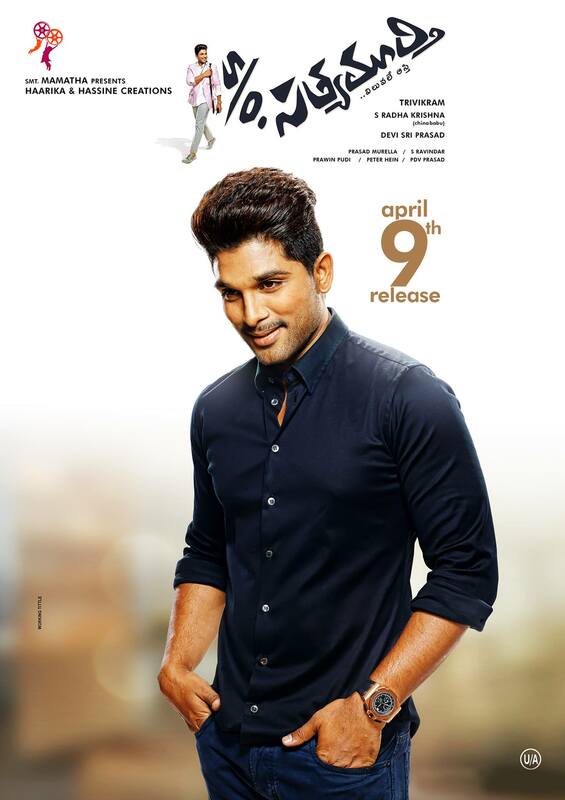 The film stars Stylish Star Allu Arjun as the son of Satyamurthy (Prakash Raj). This was my fifteenth Allu Arjun movie and the second time in a theater (after Iddarammayilatho), and he’s still my favourite dancer. His acting isn’t terrible either. (But his hair is, at least in some scenes.) The heroine is played by Samantha. She is good but gets about as much screentime as in Dookudu (which means not much). S/O Satyamurthy is a quite typical Tollywood film with almost nothing special. Now I’ve seen three movies from the director, Trivikram, and he still hasn’t really impressed me. Devi Sri Prasad’s music is OK but not his best. This is also far from the best Allu Arjun film. It was still worth watching and a rare chance to see Upendra on the big screen. He was perfect for his role and not as crazy as in his older movies that I’ve seen. The film uses a lot of dialogue and the subtitles aren’t too readable (too long lines, sometimes they are too fast, very infrequent usage of capital letters, and impossible to read on white background) so I was somehow able to follow what happened but I don’t have very clear idea about all the details. For example, Brahmanandam can get the whole audience laughing and even with the subtitles I don’t most of the time understand what was so funny. This movie would need a rewatch with pause button. However, I can’t blame only the movie about my difficulties to follow the story as my old eyeglasses caused me a little headache when I continuously had to read the small subtitles from the back row. I’ll definitely update the glasses before Baahubali. It remained a mystery to me how the organizers thought they could show a movie of length 2:40 with an intermission in a time slot of 2:15. Next they were playing a presumably tedious Finnish biographical film for a completely different kind of audience. I think I noticed some “high-culture lady” trying to enter the hall sometime during the climax scene, maybe thinking it was already the next movie that got postponed, but she was quickly scared off by furiously shouting Upendra. For a more detailed summary of the plot I recommend reading Cinema Chaat which is probably the most useful Tollywood review website on the internet. Edit (Nov 19 & Dec 5, 2015): added more award categories for 2014 movies that I’ve seen later. Preethse: A Violent Love Story! What kind of movie advertises itself as “A Violent Love Story”?! Oh, it’s an Upendra movie, I should have guessed. Upendra is famous for this kind of stuff. Preethse (“Love Me”), a 2000 Kannada movie, is actually a remake of the 1993 Hindi film Darr which I haven’t seen but which also is calling itself a violent love story, so maybe I can’t blame Upendra for everything this time. The movie is directed by D. Rajendra Babu and the main cast includes Shivrajkumar as Surya (“The Sun”), Upendra as Chandru (“The Moon”), and Sonali Bendre as their common love interest Kiran. The short intro video clip before the DVD’s main menu confirms my preconception of what kind of movie this is going to be. When love exceeds all limits it becomes pure. When the purity is hurt love becomes insane. This is a mad love story! The story is a simple love triangle drama: Surya loves Kiran and Kiran loves Surya. They have a good friend, Chandru. Kiran has a very obsessive secret admirer which happens to be Chandru but nobody knows it’s him. Chandru tries to assassinate Surya so that Kiran would love him instead. The rest of the story is all about how they find out about the stalker’s identity and who gets to keep the girl. The songs are nice and catchy and most of them fit well into the story. Music director Hamsalekha got a Filmfare Award for this movie. Previously I had seen Upendra in Upendra and A which were also directed and written by Upendra. Even though the story of Preethse isn’t by Upendra, his role was very loyal to the crazy Upendra-ish style that I’ve seen in his other movies. However, technically Preethse is far from Upendra’s directorial films – no more hyperactive editing for example. The violent love story wasn’t as violent as I had feared. I actually even liked the movie a little. The WTF feeling wasn’t as strong as during and after Upendra and A. I still have H2O to watch before I run out of subtitled Upendra DVDs for some time. It’s not rare that Indian films have crazy stalkers but few are as crazy as Chandru. (The Telugu-dubbed version of this movie has even been titled as Sadist.) He reminds me a little of Allu Arjun as Mr. Perfect in the 2009 Telugu movie Arya 2, except that in Preethse the stalking part lasts the whole movie and the final outcome is different. I can’t wait for S/O Satyamurthy (releasing this month!) which will have two of the world’s creepiest stalkers in a single movie!